Will Apps Transfer to a New iPhone? It is understandable to wonder whether your Apps will be transferred to your new iPhone. Apps are after all a very important part of the device and you wouldn't want to have to go through the process of downloading your favorite apps all over again and losing all the data on these apps. You should know though, that if your old device is an iOS device, then your apps can absolutely be transferred to the new iPhone. In this article, we are going to share with you the various ways you can transfer apps from an old iPhone to your new iPhone. One of the best ways to get data from one device to another is via iTunes. You begin by creating a backup of the old device in iTunes and then restoring the backup to the new device. The process is easy and quite reliable. The following is a step by step guide to help you transfer data to anew iPhone using iTunes. Step 1: Ensure that you are running the latest version of iTunes. If not take a moment to update the software. 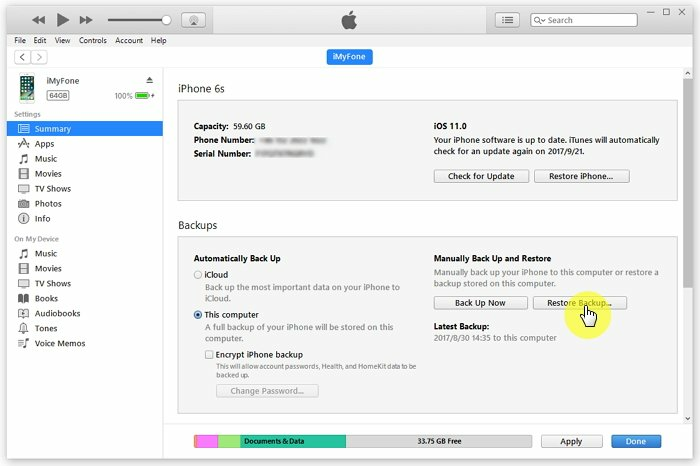 Also, ensure that you have a most recent backup of all the data on the old iPhone. If you don't, connect the old device to the computer and perform a backup of all the data. An encrypted backup will ensure that most, if not all of your password information will be transferred to the new iPhone. Step 2: Once you have a recent backup of the old device, turn on the new device. On the "Hello Screen" follow the instructions to setup the device. Step 3: Once you get to the "Apps & Data" screen, choose "Restore from iTunes Backup" and then tap "Next" to continue. Step 4: Connect the new iPhone to the computer and open iTunes. Select the device when it appears within iTunes. Step 5: Select "Restore Backup" and then choose the most recent backup you created. Enter the password if the backup you are restoring from is an encrypted backup. Step 6: Wait for the restore process to be completed and then follow the rest of the set-up instructions to complete setting up the iPhone. Keep the device connected to a Wi-Fi network to download content in your iCloud account including apps, music and photos. You can use an iPhone or iPad that is running iOS 11 to automatically set-up a new device. The process requires you use both devices and can be done in these simple steps. Step 1: Turn on the new iPhone and place it next to your current device. 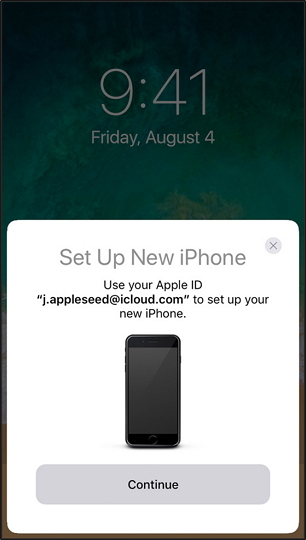 The Quick Start screen should appear on your current device offering you the option to set-up the new device using your Apple ID. Make sure the Apple ID displayed is the one you want to use and then tap "Continue." Step 2: When an Animation appears on the new device, hold the current device over the new one and center the animation on the viewfinder. Step 3: Wait for a message that says Finish on New iPhone and if you can't use the current device's camera, choose "Authenticate manually" and follow the steps. Step 4: Enter the current device's passcode on the new device and follow the instructions to set up Touch ID or Face ID on your new device. Step 5: Enter the Apple ID password on the new device and then restore the apps, data and settings from a most recent iCloud backup. Step 6: Keep both devices close as everything including settings and passwords are transferred. Connecting the new device to a power source and a Wi-Fi network will automatically download all your music, apps and photos. If you want to restore just some of the app data from your old device to the new one, there is one program that can allow you to do that. 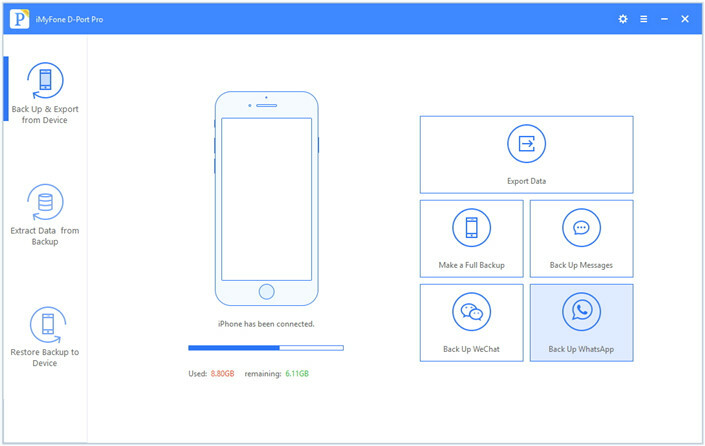 iMyFone D-Port Pro is a backup and restore tool that you can use to restore just WhatsApp data from a backup to your iPhone. The following are some of the program's other features. It is much flexible to restore backup. 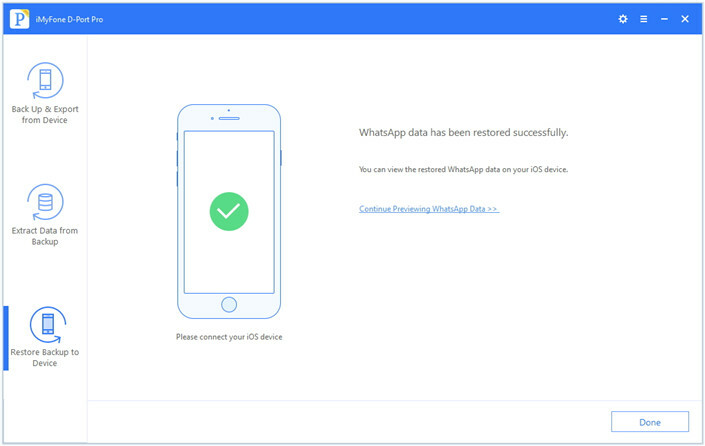 You can just restore your WhatsApp data, WeChat Data and messages from your iTunes or iCloud backup. You can also use D-Port Pro to export 16 types of data from your iPhone, iTunes backup or iCloud backup to computer. 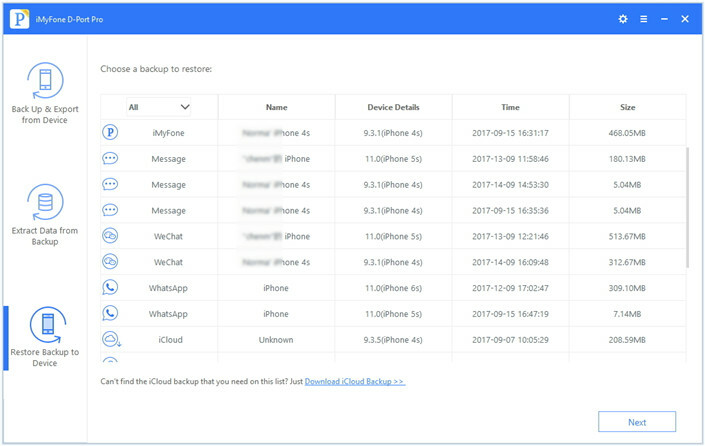 To transfer WhatsApp data from your old iPhone to the new one, using iMyFone D-Port Pro, you will need to first backup the data from your old iPhone on to your computer. Here's how to do it. Step 1: Download and install iMyFone D-Port Pro to your computer. Launch the program and then choose "Backup and Export from Device." From the options on the right, select "Back Up WhatsApp." Step 2: On the next screen, click "Back Up" to proceed. 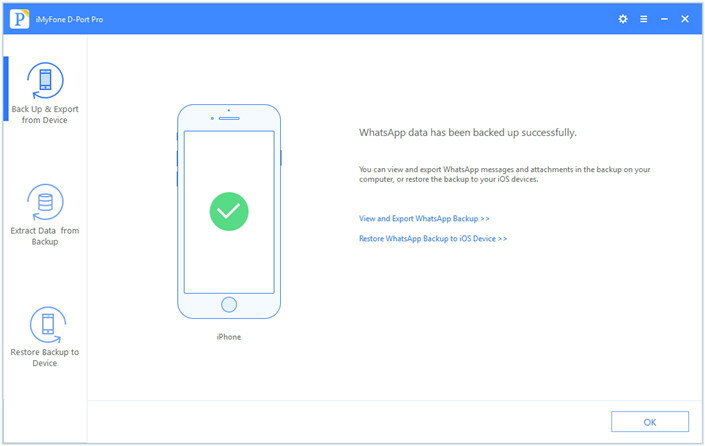 Step 3: The program will back up the WhatsApp data on the old iPhone to your computer. You should receive a notification when the process is complete. 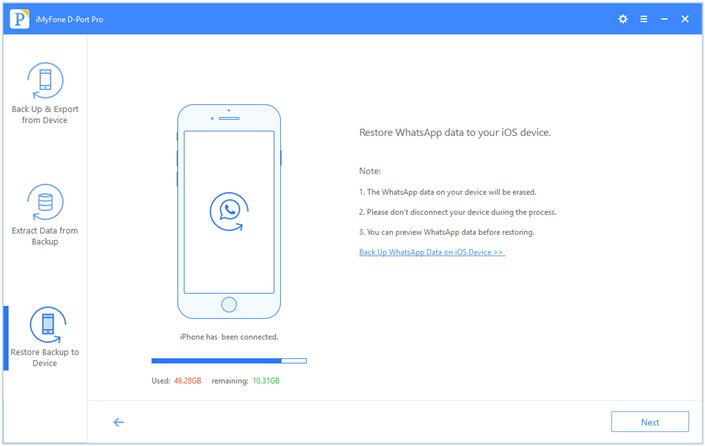 Now all you need to do is restore the WhatsApp data to the new iPhone. Here's how to do that. Step 1: On the program's main window click "Restore Backup to Device". You may need to connect the new iPhone to the computer at this point. 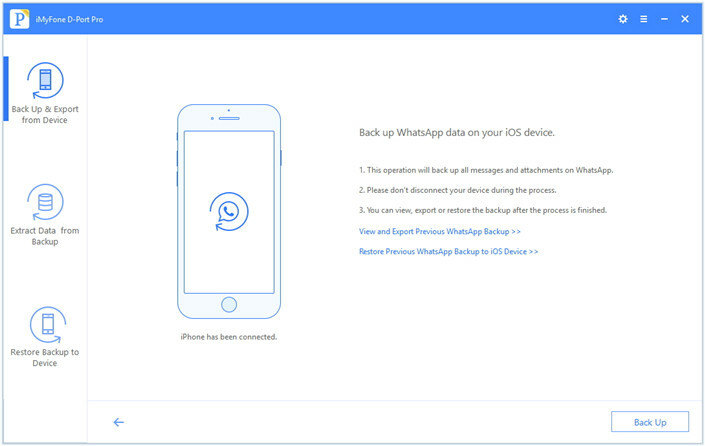 Choose a "WhatsApp" backup to restore and click "Next." Step 2: Now you just need to read the notes and click "Next" to proceed. 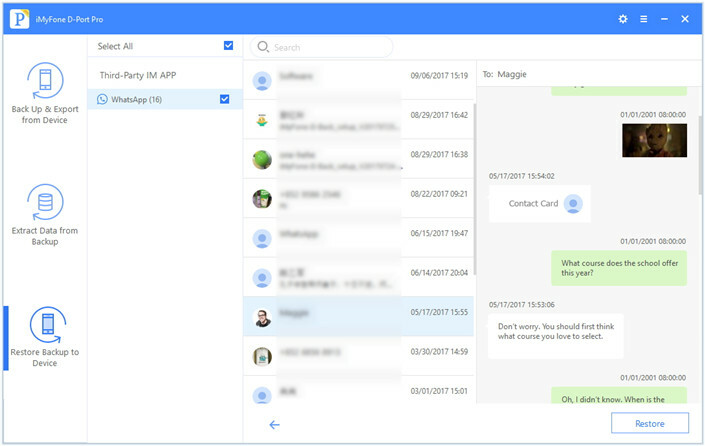 Step 3: In the next window, the program will display all the WhatsApp data found. You can then simply just preview and select the ones you need and hit "Restore." Once the process is complete, the WhatsApp messages will be available on the new device.